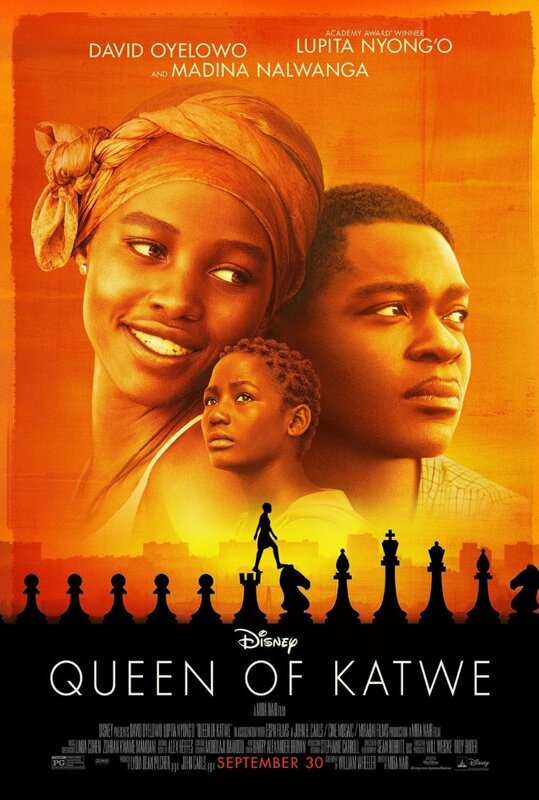 RYAN: This is a true story based on the life of the recent chess champion from Uganda – a young girl – brilliantly portrayed by a new actress on the scene, Madina Nalwanga. She’s incredible. This is her first movie and she carries it so well. She could get a nomination, as could Lupita Nyong’o in the supporting category. She is so phenomenal, I wanted more of her. There’s something so real and fresh and natural about Lupita’s skill as an actress. No matter what she does, you believe her, even more than almost any other actress. CHUCK: I totally agree. She’s one of the best actresses I’ve ever seen. RYAN: I also love David Oyelowo. He’s also Oscar worthy in this film. For a movie that’s not a fantasy, it does amazing storytelling and totally transports you to this slum in Africa. It was very very well depicted, well acted; you feel their joy when it’s happy. CHUCK: Absolutely. And the whole cast was terrific. So many great children in this. I have a feeling all unknowns but Madina in the lead is exquisite; just subtle. Almost like she’s a natural. Yes, David is unbelievable. And it wasn’t just a fairytale. It’s a live action Disney film, based on reality that shows the dark sides of living in poverty. RYAN: It’s not the typical sports movie. It’s a story of the human spirit and how gaming can parallel and uplift you. I like chess. My father taught me how to play but you still have trouble following what was happening because you can’t really tell by the moves, the way you can in a baseball or football movie. Yet it feels like a sports competition movie. It’s less rousing and suspenseful, but still makes you want to root and cheer. You still relate to their emotions. CHUCK: Sports are more physical and filled with action whereas chess, here, just involves two people sitting at a table; so that’s why it’s a bit less exciting. But i think they might have followed how the actual players played these historical games. RYAN: I really liked the color in this movie. It’s very bright in color. And director Mira Nair redeemed herself, for me here, since I hated her film Vanity Fair. CHUCK: I never saw that. But she’s very well known in India. Details were wonderful; the costumes really fit and some of the places, and the way things are shot were well done. RYAN: Music is also effectively used; incorporated in a way that helps bring out emotion. CHUCK: It’s a really important story right now. It’s empowering and aligned with new Disney philosophy – it’s great for young girls to see powerful female characters. Lupita was a fierce mother. RYAN: I totally agree and her moral code, in a very challenging time, was very impressive. More than anything, this is inspiring. It’s a real underdog story and a true story. There is something to take away from this- a lesson if you look at her life, or even the lessons of David’s character. And I love at the beginning of the credits, you see the actor and the real life person that they portrayed, together with an update about what they’re doing now.